When Truman Capote threw his now infamous Manhattan black and white ball in 1966, no one suspected that along with society glitterai, he was also tapping into a long standing design schema; the push and pull of black and white. Representing the highest level of contrasts on the color wheel (though not really colors in and of themselves) – the stark and immediate contrast of these two ‘non-colors’ have intrigued the design world for centuries. 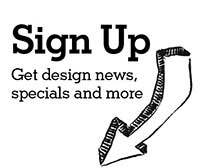 Here are some products that can help you define your own black and white stories. If the Horizon has a striking similarity to the all-new iMac®, it’s not by accident. 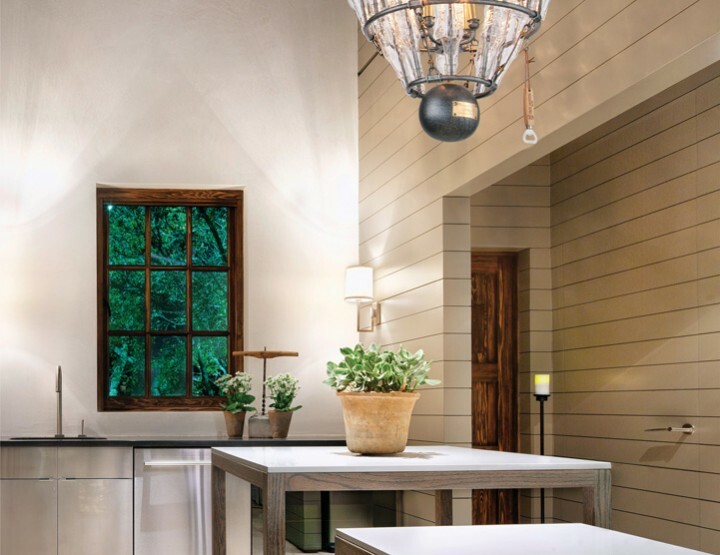 As the designer who brought a sleek, new-minimalist sensibility to Apple®, Robert Brunner has infused this range hood with a similarly striking style. 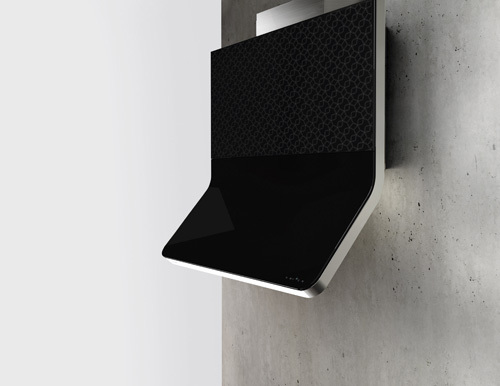 Horizon enters a low-profile freefall just inches from the kitchen wall, then challenges its audience with a sweeping, 30 degree upward lift. Compelling in red, black, white glass or stainless steel, the glass surface may be etched in one of two patterns: a leaf motif on white glass or flower on black glass. A removable front panel for easy cleaning and service access and a duo of halogens, completes this beauty. 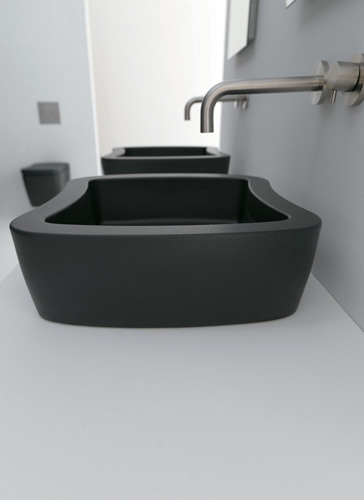 Molded from fireclay ceramic, Hastings Nutty Vessel Basin in matte black is as sensuous as it is masculine. Gentle curves provide additional visual delight to its generous 5 7/8 inch deep bowl. 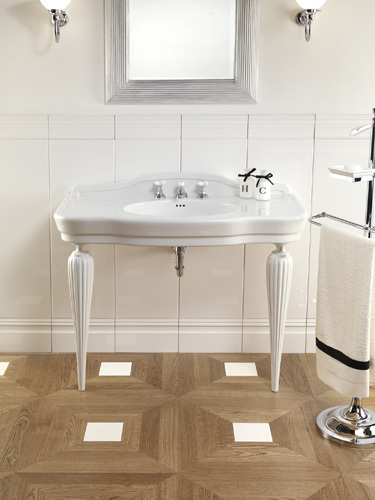 The perfect complement to polished nickel or chrome fixtures, the Nutty Basins also have a coordinating line of toilets and bidets to complete their look. 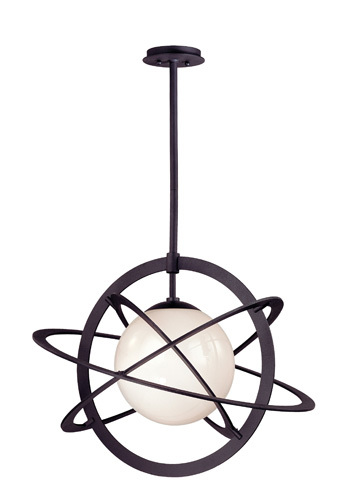 Cosmos by Troy Lighting adds a playful twist to black and white decor. The celestial design’s central sphere radiates light and vitality into the room, while the bronze work (resembling planets traveling around the sun) orbits the sphere to create its own delightful cosmos. Cosmos comes with opal white glassware, federal bronze finish and is suspended by a hang-straight canopy. The Serenade Console by Devon & Devon exudes classical and sinuous lines, with its large white fire clay ceramic top and distinctive white cast aluminum legs. 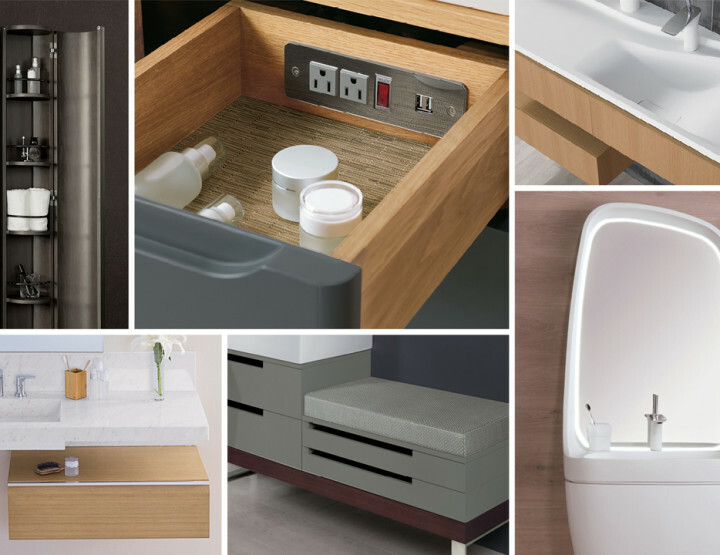 A vertical groove with discreetly “imperfect” finish completes the hand-crafted look. The console rests “en pointe,” giving a nod to times gone by and ultra-chic glamour. The top and legs are available in black or white. Legs are also available in antique nickel finish. The Mossi Collection celebrates the combination of fine metals and crystal with its fluid lines and dewdrop-shaped crystal pearls. 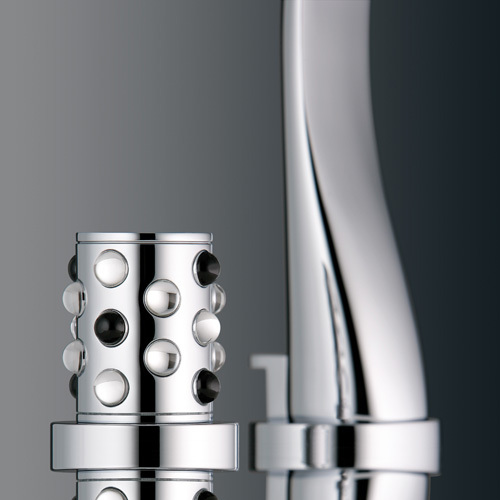 The collection is comprised of a faucet and coordinating accessories. 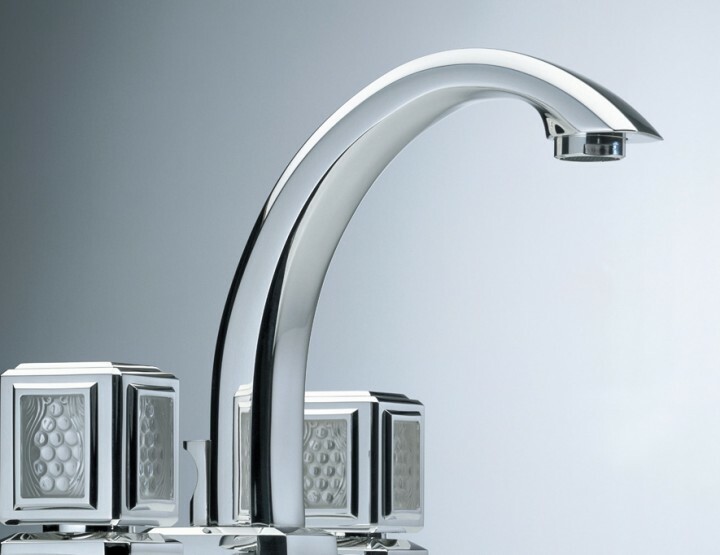 The faucet features a modern, linear design and the handles are sprinkled with Lalique crystal spheres. The collection is available in two versions: Mossi Cristal Clair in clear Lalique crystal and Mossi Cristal Soleil in sun crystal. 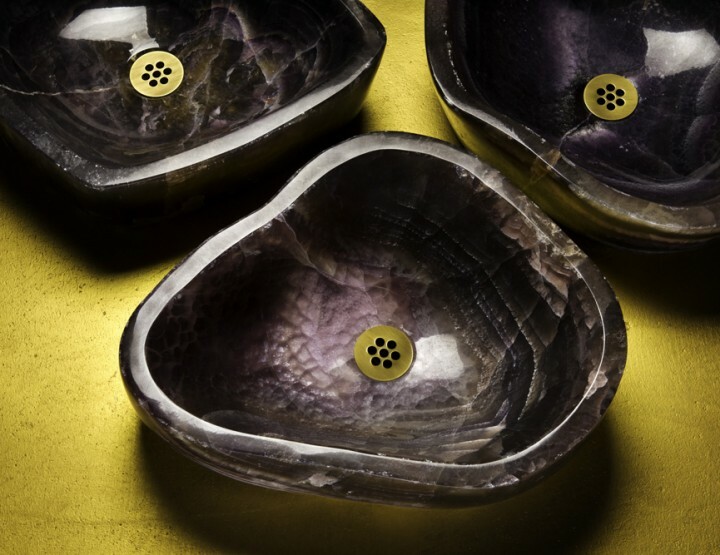 New crystal sphere options are black onyx and amethyst which contrast against the chrome or luxbrass in a way that takes your breath away.